Want to skip to the results? 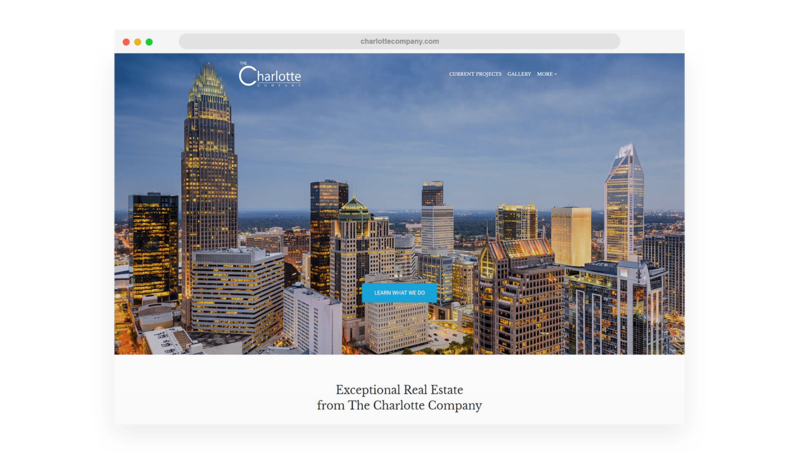 View the Charlotte Company website HERE. We’ve had a strong working relationship with The Charlotte Company for some time now. Affios has built three of their business websites (1530 Hawthorne, Shady Knolls Homes & Noda Heights Properties) with exceptional success. So when the team decided it was time for their main website (CharlotteCompany.com) to get the Affios treatment, we were all excited. The Charlotte Company develops a vast number of properties across Charlotte, North Carolina. They had an existing template website from GoDaddy that was doing a disservice to the brand as well as to their potential clients. It was time to bring the website into current times. The Charlotte Company’s edge over their competitors is a mix of their focus in Charlotte, the scale of their projects (with the speed of completion) and their exceptional portfolio. We wanted to make it our priority to get this across in their messaging. The site was built to feel much like a single page website, with a minimal navigation (that houses a further 7 pages) to ensure the core message is received. Thanks to the beautiful projects the client has completed, we had beautiful photography to make use of, which always helps sell a project like this. Both The Charlotte Company & Affios were proud to have worked on this project together. Seeing their business now have a website that matches their business to the core is what drives us. Not only has the website pushed their brand, but it has also helped give an online presence to a otherwise physical market. To view the Charlotte Company website, just click HERE.